Sony announces Xperia T2 Ultra, a newer version to their Ultra family and this time with LED flash. Today, Sony have officially announced Xperia T2 Ultra, a new addition to their phablet family which is currently lead by the Sony Xperia Z Ultra, a very successful device brought by Sony which featured a massive 6.4-inch screen with a super slim design, also it is the first smartphone which featured the Qualcomm’s Snapdragon 800 processor. Featuring a 6” HD Triluminos TFT screen with X-Reality for mobile picture engine with a 720p display which sums to 720 x 1080 pixels of resolution which comes with 245ppi. The phone is build at a very slim design as well with only 7.65mm of thickness which is of course not as thin as the Xperia Z Ultra which is only 6.5mm in term of thickness. The Xperia T2 Ultra comes in two variants, a single sim and a dual-sim device that supports dual standby mode. Under the hood, the Xperia T2 Ultra features the Qualcomm Snapdragon 400 quad-core processor ( MSM8928 ) clocked at 1.4GHz, a quite outdated processor but hey, most of the quad-core processors introduced by Qualcomm are extremely fluid and highly capable of providing you a very satisfying user-end result. However, this device only comes with 1GB of RAM, which is disappointing from my point of view despite most Android devices with later versions could satisfy and perform much better with 2GB of RAM. The internal memory for this device is only 8GB but not to worry as microSD slot is present as well which could provide you external memory expansion up to 32GB or even more as well all know most of the Android smartphones could still able to support 64GB microSD card. The rear camera is the most attractive part as it comes with 13MP with LED flash and powered by the Exmor RS mobile sensor, while the front shooter carries only 1.1MP. The Xperia T2 Ultra has LTE connectivity ( dual-sim version is only HSDPA version) as well as NFC, with a 3000mAh of non-removable battery should provide a decent battery life for such specification. Do take note that the T2 Ultra would be released with the Android 4.3 Jellybean only, quite frustrating that a newly announced device would not come with the latest Android 4.4.2 KitKat, but it is understandable as none of the Sony smartphones have yet to receive an official KitKat update, so by time their flagship devices such as the Xperia Z1, Xperia Z1 compact, and the Xperia Z1s gets the KitKat update, I am quite sure the Xperia T2 Ultra will eventually get it as well. 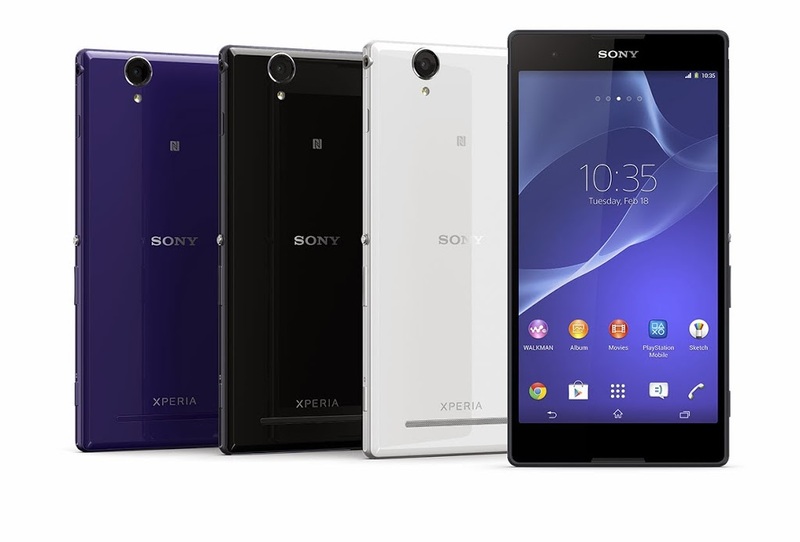 How would you rate this new phablet range from Sony? Would you get this version instead of the Xperia Z Ultra as the Xperia T2 Ultra features a better camera and also with the LED flash which lacks in the Z Ultra. However, looks like there is no waterproof capability for the Xperia T2 Ultra, as Sony is well known for that feature on most of their Flagship smartphones. Previous ArticleSamsung Galaxy Note 3 Android 4.4.2 KitKat update is rolling out now, starting at Poland. ASUS ZenFone Selfie and ZenFone 2 Laser goes live on ASUS Malaysia online store! Samsung Galaxy Note 3 Neo for only RM850?